Please note that the p&p costs below are for UK delivery. If you would like overseas delivery please email shop@minervasowls.org for details. 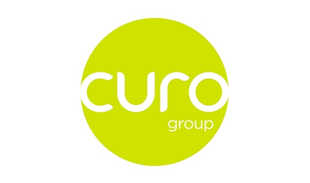 The click and collect option is no longer available, so please ignore the collect option from the drop-down menus. 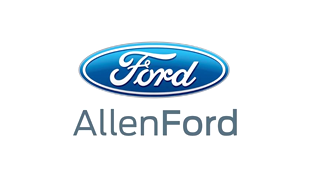 Payments are via PayPal (no account required). 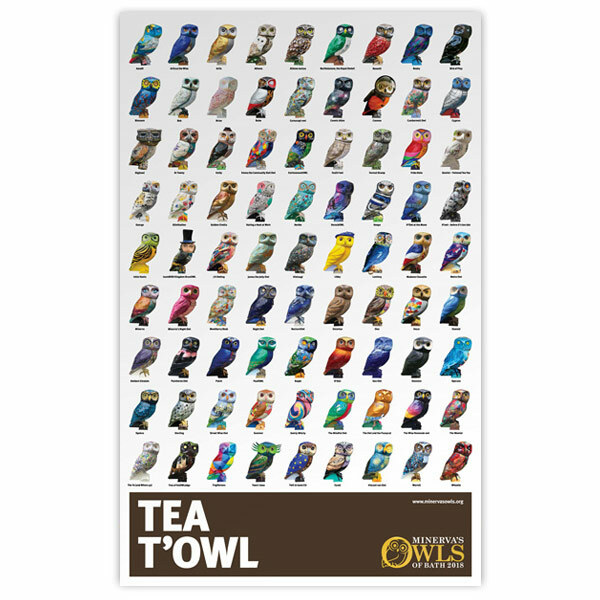 Fabulous large tea t’owl featuring all of the Owls of Bath. 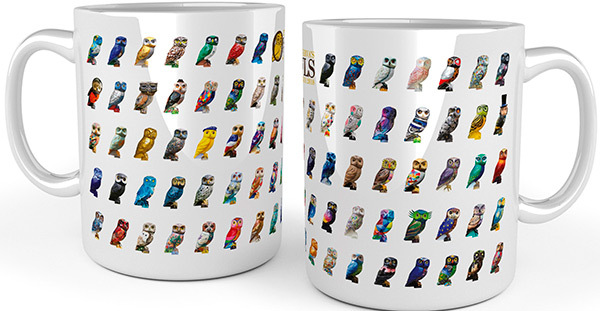 Each owl is named – a great way to remember the flock and add fun and owlery to kitchens across the land. Cotton tea-towel measures 74cm x 47cm, with useful hanging hoop. 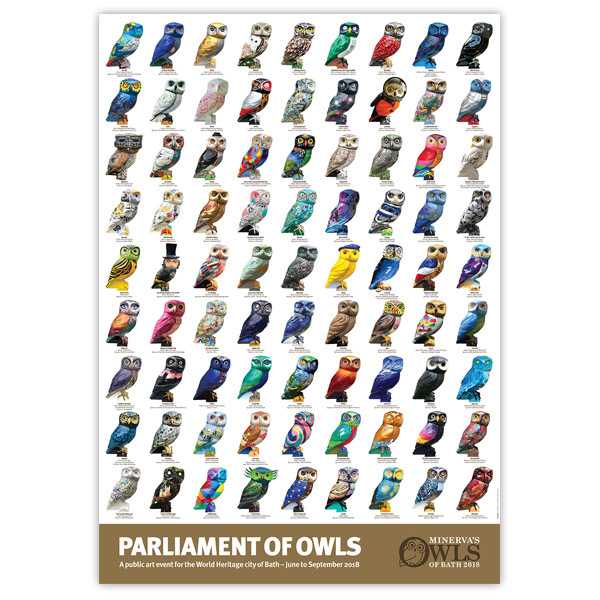 Beautifully produced, glossy A1 size poster featuring the fabulous Minerva’s Owls of Bath flock – size 61cm x 91cm (35.8” x 24”). Fits Ikea/standard frames. 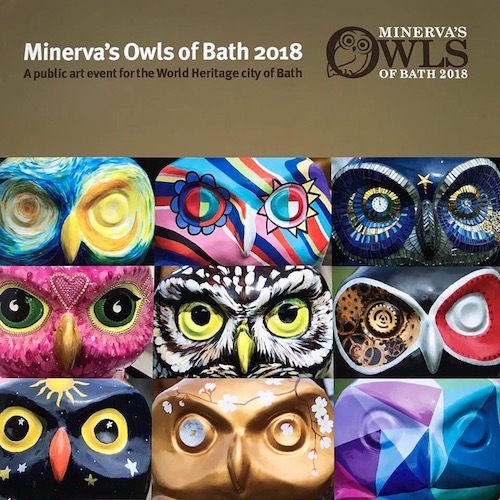 48 page colour book featuring the Owls of Bath story, from its Roman Baths and Goddess Minerva inspiration to owl sculpture's design, moulding and hatching and public art sculpture trail. 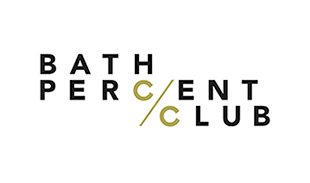 Over 200 fabulous photos and fun behind the scenes moments. A lovely Christmas present! 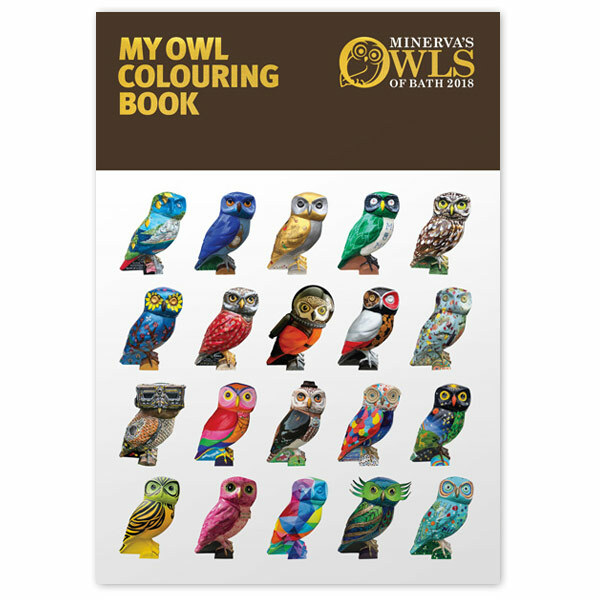 24 page A4 colouring book for young designers to create their own owl characters.  Features owl templates to colour in and add your owl designs to and each page has a different fun fact about Little Owls – hours of entertainment for creatives of all ages! 20 cm tall. Hand-made in Bath from solid plaster. 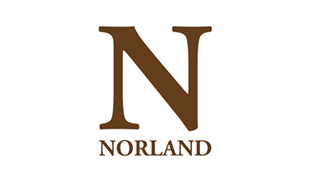 Weight 1.9 kg. Please note, there are some imperfections in the gold spray to give it an antique 'distressed' feel. 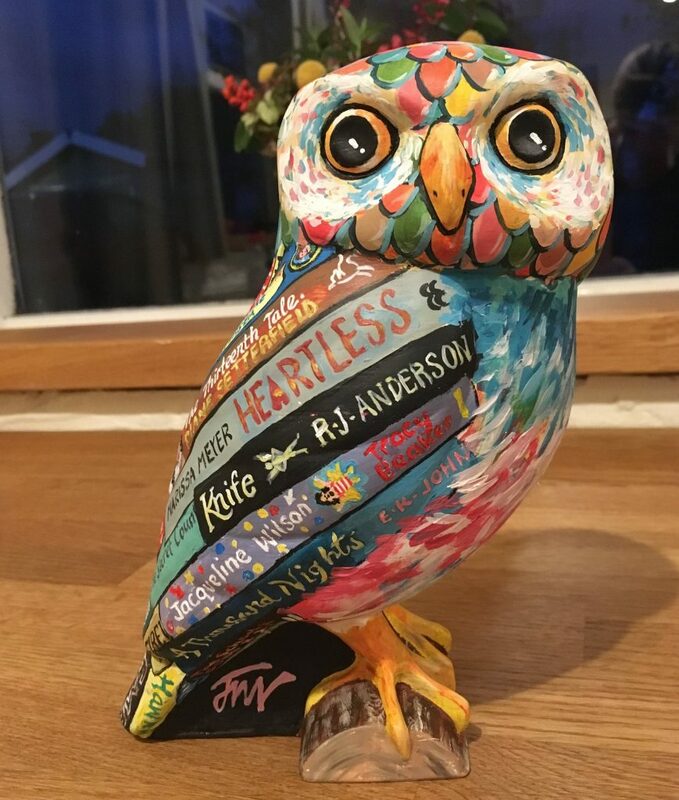 Some of our artists would be happy to decorate your mini owl for you - see example here of several 'J K Owling' commissions, painted by Jo McCarron. 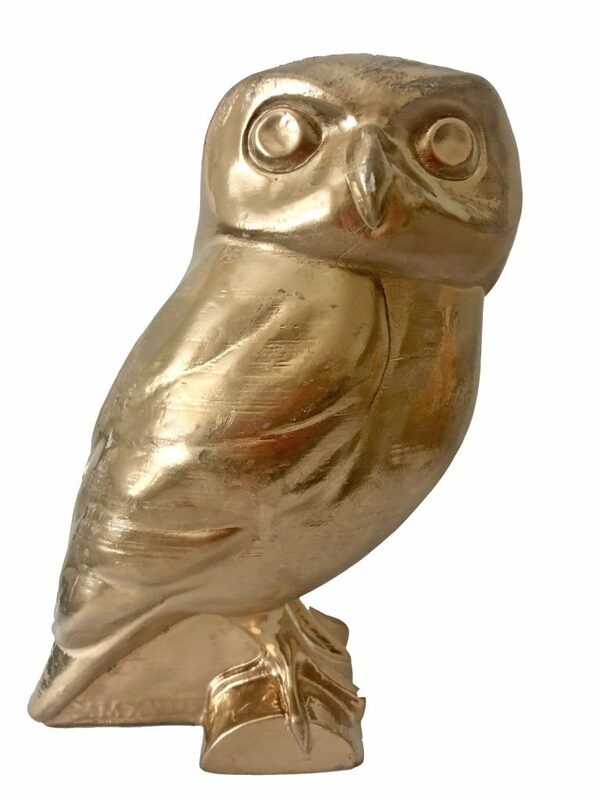 Prices will vary depending on the complexity of the design, so please email us on shop@minervasowls.org and we will put you in touch with your favourite artist. 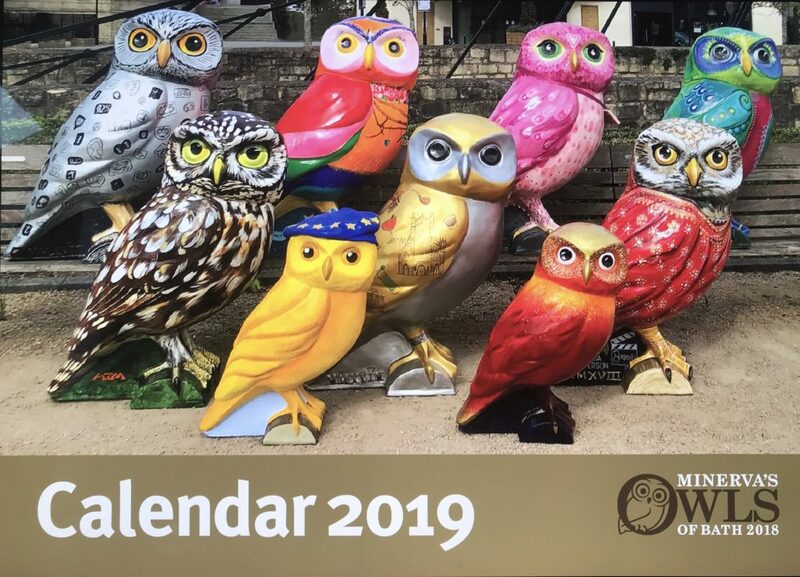 The glossy A4 calendar, with gold highlights on the front and back covers, featuring stunning images of the Owls of Bath 'parliament' on each of the month-at-a-view pages, plus an additional image on the rear. A perfect Christmas present that will keep on giving all year! 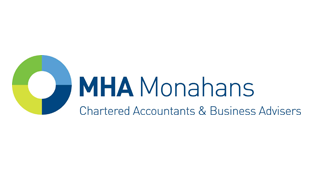 Debit card payments for additional postage or other items can be made via the link below. Enter the amount you are paying into the Payment Details window. In the 2nd window, either choose PayPal or Guest PayPal, where you can use most credit cards without having a PayPal account.